I left a little before 8:00 this morning. It was only about 55 degrees so I dressed warm and headed back out on to 160. When I got to Del Norte, I turned on to 112 and then on to 285. Most of the ride was across flat farm land with the mountains off to the side. When I got to Poncha Springs, I turned east on 50 towards Canon City. Again, it was mostly flat farmland and not all that scenic. About 1:00 I decided that I’d start heading home. The GPS said I was about 1,800 miles from home and I figured that if I could get a couple of hundred miles out of the way today, I’d be able to make it home by Sunday evening. I stopped about 6:00 because I could see storm clouds, lightning, and a rainbow to the east and rather than ride into the rain, I decided to stop for the night instead. I’m about 1,450 miles from home now in Salina Kansas. I left around 8:00 again this morning and headed east on I70 to Grand Junction. Not long after leaving the motel, I ran into some wet road. There were dry spots so it must have stopped raining about 30 minutes before I got there. As it turns out, this was a common theme for the day. The scenery along I70 is typical of many places in Utah. 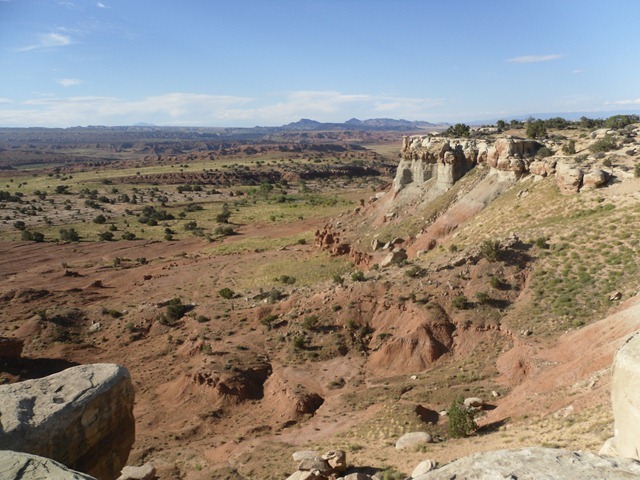 Large mesas, interesting rock formations, and numerous canyons make Utah an incredible place to visit. Every time I ride through Utah, I’m always impressed by the vastness of the landscape. As I arrived in Grand Junction, it was obvious that it had just finished raining. There was a lot of water or the streets and the dark clouds where just outside of the city. Another luck break as far as rain goes because it looks like there had been a good amount of rain just before I got there. From Grand Junction, I turned south on 50 towards Montrose and then on to 550 to Ouray. 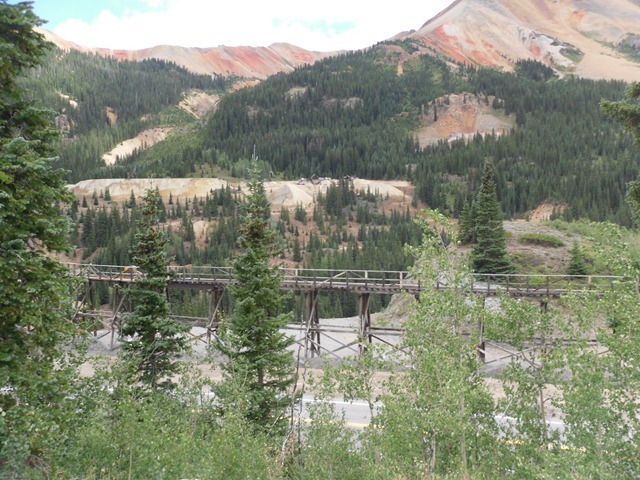 Ouray is the beginning of the “Million Dollar Highway” that runs through the mountains and then ends in Silverton. 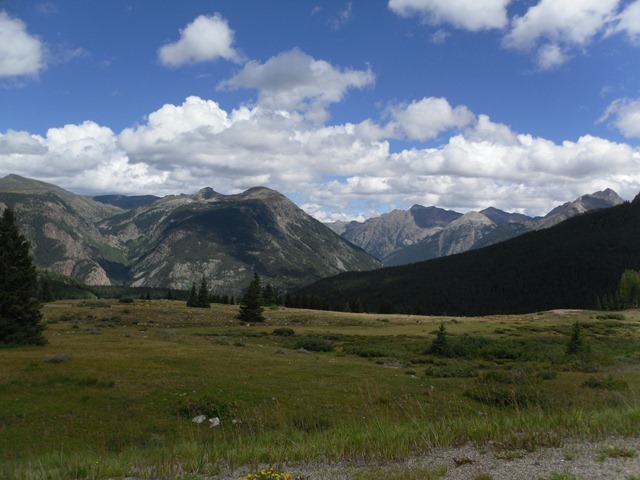 The scenery on this road is right up there with the best of Glacier Nat’l Park. Yosemite, or virtually any place else I’ve been. 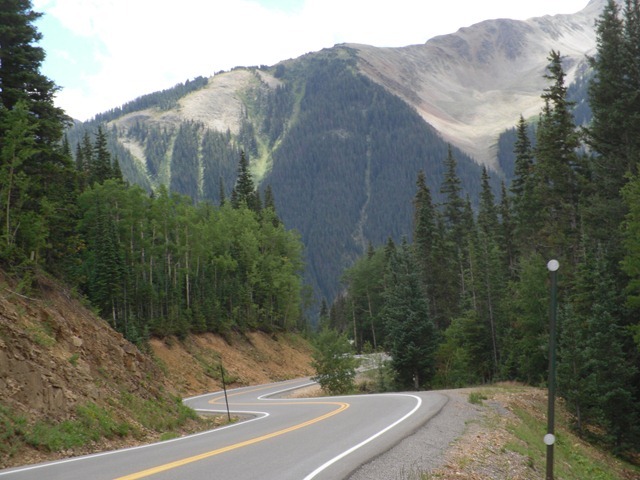 It has the usual hairpin turns, sheer drop-offs, and of course no guardrails. 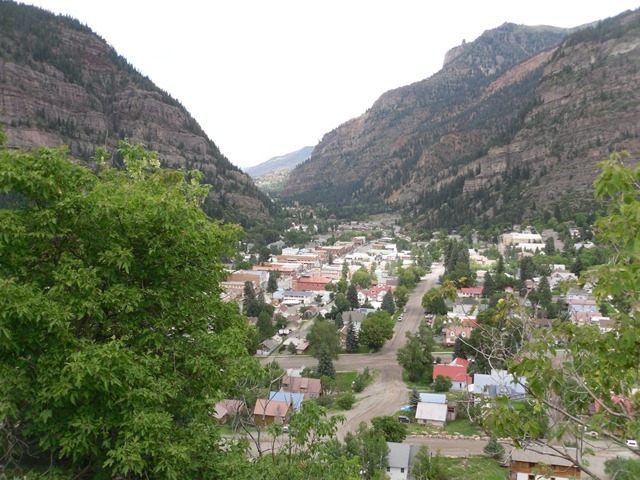 From just outside of Ouray, I stopped and took this picture of the town from about 500 feet above the town. As you can see, it’s a relatively small town that sits at the bottom of a valley formed by steep mountains on both sides. This area has many small abandoned mines. According to some of the markers at the viewpoints, there was much silver, copper, and gold in these hills that was mined in the 1800’s. 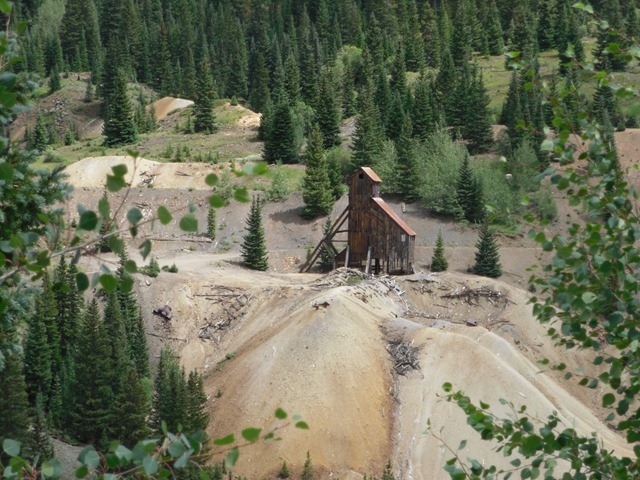 One of the mines contained a vertical vein of silver that went straight down over 1,200 feet. There were quite a few of these old mines throughout the mountain sides. You can see various colors of dirt piled up beneath each of the mines where they had dumped the dirt they dug out of the mines. It didn’t look like any of the mines were still active but I’m no expert when it cones to mining so it’s possible that someone is still digging in these hills somewhere. There’s really no way for me to adequately describe what this road is like so I’ll just post a few pictures here and you can see for yourself how beautiful this road was. When I got to Silverton, I checked my map to see where I wanted to go to next. I saw a road on the map but it was shown as kind of a dashed line indicating that there was long term construction on that road. I went inside and asked one of the locals about the road and he said I didn’t want to go on that road because it was a County road and was for 4×4’s with high clearance only. I took his advice and decided to continue down 550 to Durango. When I got to Durango, I headed east on 160 towards Pagosa Springs. I knew this road seemed familiar and as it turns out, I was on this same road last year except I was going toward Durango instead of away from it. I didn’t mind because it’s a nice nice ride through the mountains whether it’s the first time or the hundredth time. I stopped for the night in South Fork Colorado and after checking in and bringing my stuff to the room, I went down the road 500 feet to a small bar/restaurant. As i left the parking lot, I felt some raindrops but it was about a 10 second ride so I didn’t worry about it too much. After eating, it was still raining so I had another 10 second ride back to the motel. Another lucky break as far as rain is concerned. Now for a couple of quick notes about the bike. The display on the radio is now completely blank. Good thing I have the sequence memorized to change between CD, AUX, adjusting bass and treble, etc. Another thing that happened to the stereo was that the left speaker in the fairing blew out. I actually got some replacement speakers when I was still in California so all is good as far as that’s concerned. The tires are holding up pretty well so far. They have about 7,500 miles on them and the rear is a bit squared off but still has a good amount of tread left. The tires seem to work well – they don’t follow groves in the road, they ride nice and smooth, and they seem to be very good in corners. I’ve scraped the highway pegs quite a few times and even scraped the right floorboard earlier today. Tomorrow will probably be my last day riding around out here. I’ll probably start heading back home Saturday morning. 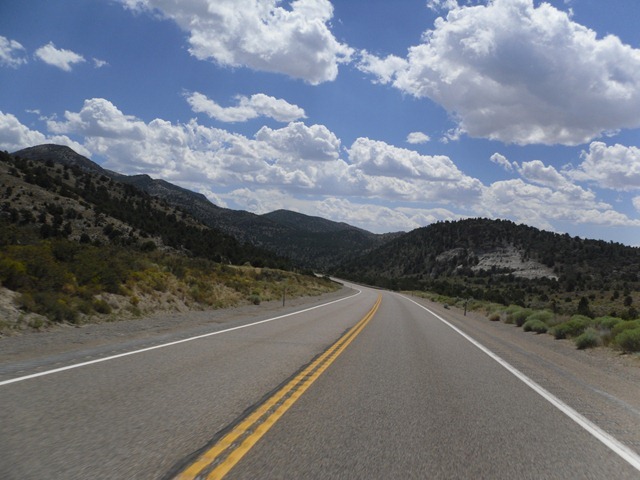 I left Reno this morning around 7:30, hopped on I80 for a few miles, and then turned on to Nevada RT 50 – America’s Loneliest Road. RT 50 goes all the way across the center of Nevada through some very remote areas. 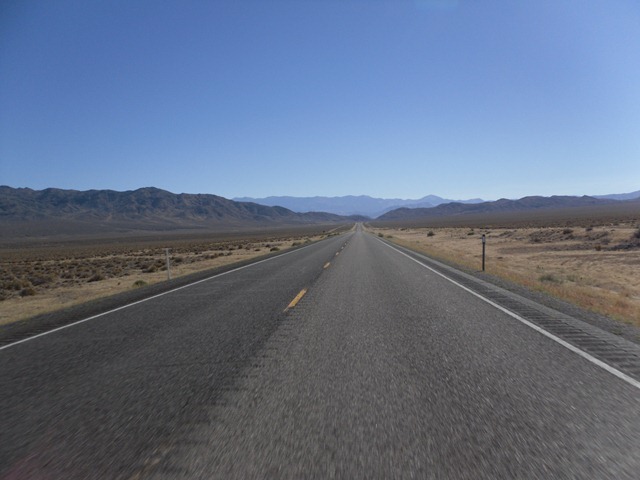 The road is long, straight stretches of land with small mountains visible on the left and the right side the majority of the time. Every hour or so, I’d ride through a small town and then continue off into the desert once again. The weather was pleasant all morning – bright blue skies and not a single cloud visible anywhere. The landscape is essentially barren with the exception of some sage brush and other small desert bushes. There doesn’t seem to be any real agriculture, farming, or much of anything else out here, it’s just miles and miles of road that never seems to end. Every once in a while and generally when approaching a small town, the road would have some nice curves and either climb or descend a small mountain before once again returning to a flat straight road. In the afternoon, it got a bit warmer but remained quite comfortable for riding. Some clouds appeared and when the sun went behind the clouds, it became noticeably cooler for a few minutes. 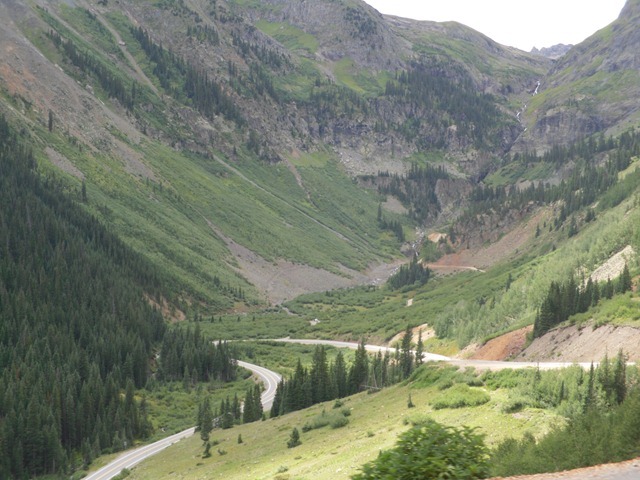 This road is generally from 5,000 to 7,500 feet above sea level. I mention this because this new bike seems to have much better power at higher altitudes than my ‘06 does. Even with the new bike, it’s clear that high altitude robs power, but it just doesn’t seem to be as noticeable. I don’t know if this is the 103 motor vs… the 88 inch motor or maybe the 103 has a fuel map that tolerates the altitude better. 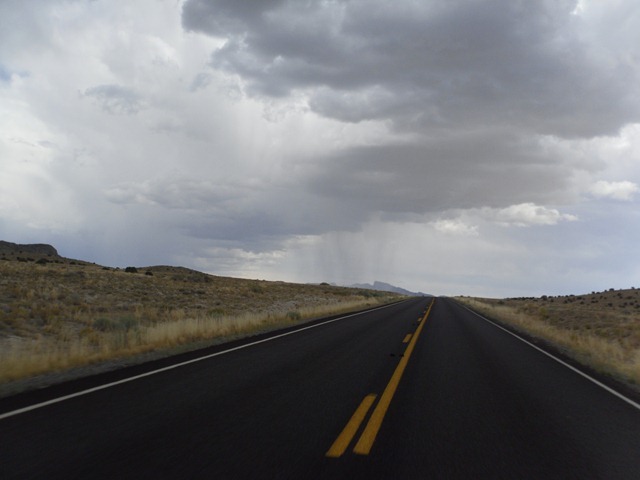 Late in the afternoon, about the time I entered into Utah, I started seeing some dark clouds on the horizon. I could see areas where it was obviously raining but luckily, I only hit a few small spots of rain that only lasted a minute or two. I really didn’t even get wet and the rain evaporated from the road almost instantly. For the last 2-3 hours of the day, I kept thinking that I was going get wet but thankfully, I never ended up with more than a few raindrops on my windshield. That means that so far, I really haven’t had to drive through enough rain to put the rain gear on. The last stretch of today’s ride was a short trip down I70 to Salina Utah where I got a room for the night. I hit some very strong winds on I70 that would push me from the right lane to the left lane despite leaning hard to the right to stay in my lane. Since it was so windy, I cut the day a bit short stopping at 6:30pm for the night. Tomorrow, I’ll head into Colorado. 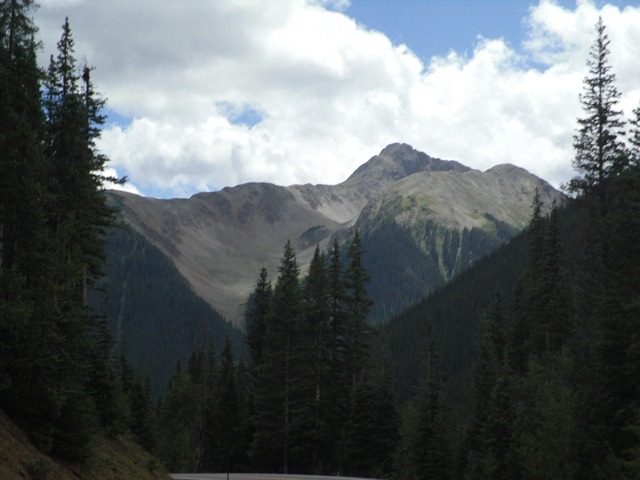 I’m planning to head towards the “Million Dollar Highway” – Colorado 550 between Ouray and Silverton. The laptop is working again so I’ll take a few minutes to catch up on some the details from yesterday’s ride. Rt. 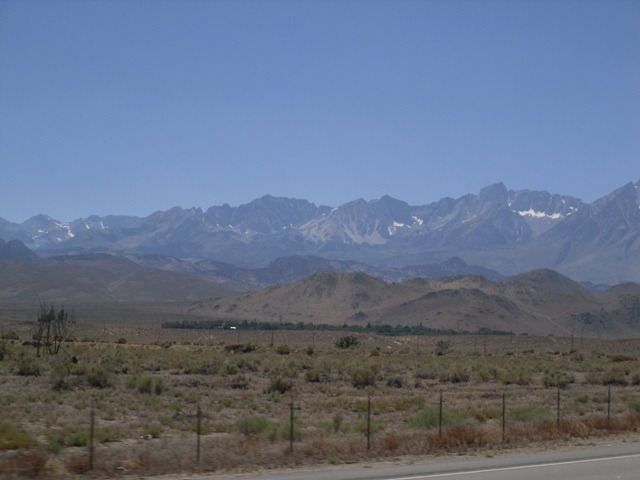 395 lies east of the Sierra Nevada mountains and takes you through flat desert land with the mountains visible at all times. I’m not a big fan of riding in the desert but it’s unavoidable in the western part of the US. It was a bit odd riding through the hot, dry desert with patches of snow visible in the mountains. I rode for quite a few hours alongside these mountains thinking about how nice it would be to ride in the cool air up in the mountains. Eventually, the road starts climbing into the mountains and and the scenery becomes more to my liking. Trees start to appear, the straight roads turn into nice long sweeping curves, and the brown landscape turns more green. I left 395 temporarily to get gas in Mammoth Lake. The air cooled down and became quite pleasant and at this point, I’ve ascended to about 7,500 feet above sea level. 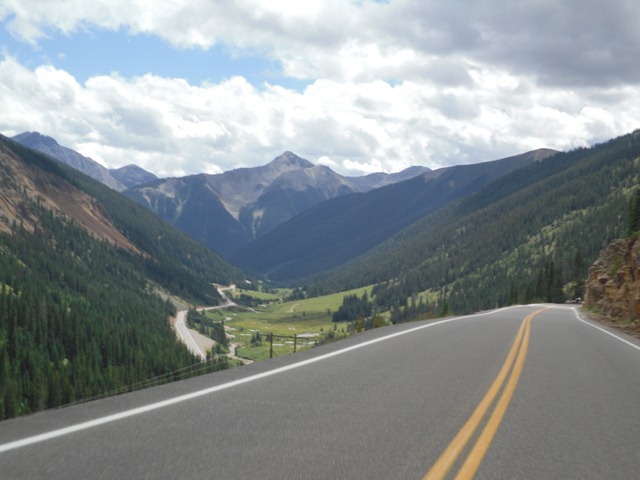 The roads are nice winding mountain roads that meander between lakes through a forest filled with Ponderosa Pines. This is a beautiful area with plenty of campgrounds, hiking paths, and paved two lane bike paths running through the woods. Since i wanted to get to Reno before stopping for the night, I only rode about 10 miles and turned around and returned to 395. I spend the next few hours riding through the mountains on 395 crossing into Nevada and finally to Reno. Since I was in Reno, I decided to stay in one of the resort casinos. I’m not really a gambler so I didn’t play any games but I did spend a bit of time wandering around watching people feeding coins into slot machines and playing the various games. Well, it looks like my laptop isn’t working anymore so I’m posting this from my Blackberry so it’s going to be short. I left Kaydee’s house around 8:30 this morning and headed North on 395 towards Reno. It got pretty hot as I rode along the bottom of mountains that had small patches of snow on top of the peaks. 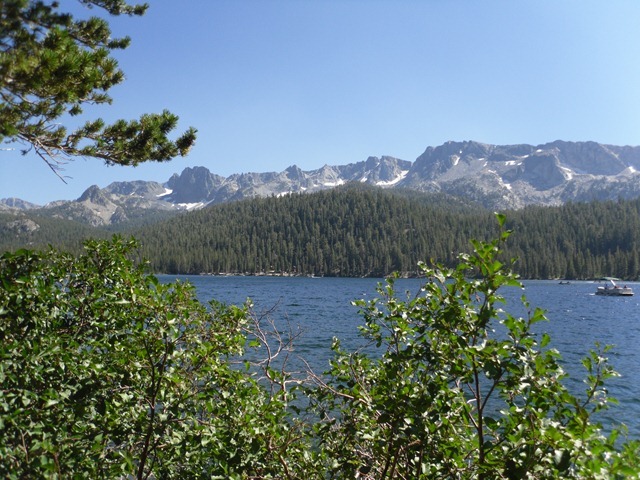 I took a short detour to get gas near Mammoth Lakes and it looks like a real nice place. Maybe I’ll go back there again in the future and spend a bit more time riding around the area. I ended up staying at a large casino hotel in Reno for the night. I don’t gamble but it’s interesting to wander around and check it out anyway.